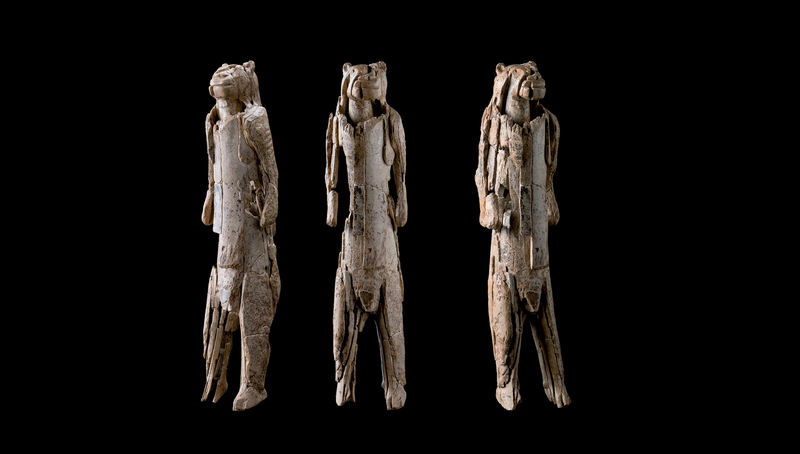 Ahead of the exhibition Living with gods, Jill Cook takes a closer look at one of the exhibition's key loans – the Lion Man, an incredible survival from the last Ice Age. Lion Man from three angles. Stadel Cave, Baden-Württemberg, Germany, 40,000 years old. © Ulmer Museum. The Lion Man is a masterpiece. 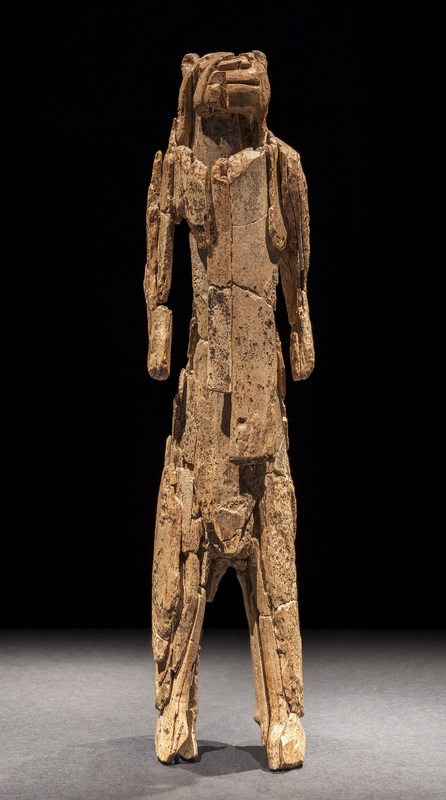 Sculpted with great originality, virtuosity and technical skill from mammoth ivory, this 40,000-year-old image is 31 centimetres tall. It has the head of a cave lion with a partly human body. He stands upright, perhaps on tiptoes, legs apart and arms to the sides of a slender, cat-like body with strong shoulders like the hips and thighs of a lion. His gaze, like his stance, is powerful and directed at the viewer. The details of his face show he is attentive, he is watching and he is listening. He is powerful, mysterious and from a world beyond ordinary nature. He is the oldest known representation of a being that does not exist in physical form but symbolises ideas about the supernatural. Found in a cave in what is now southern Germany in 1939, the Lion Man makes sense as part of a story that might now be called a myth. The wear on his body caused by handling suggests that he was passed around and rubbed as part of a narrative or ritual that would explain his appearance and meaning. It is impossible to know what that story was about or whether he was deity, an avatar to the spirit world, part of a creation story or a human whose experiences on a journey through the cosmos to communicate with spirits caused this transformation. Obviously, the story involved humans and animals. Lion Man is made from a mammoth tusk, the largest animal in the environment of that time and depicts the fiercest predator, a lion, now extinct, that was about 30 centimetres taller than a modern African lion and had no mane. Distinct from other animals through their use of tools and fire, humans were nonetheless dependent on some animals for food while needing to protect themselves from predators. Perhaps this hybrid helped people to come to terms with their place in nature on a deeper, religious level or in some way to transcend or reshape it. This was a lot of time for a small community living in difficult conditions to invest in a sculpture that was useless for their physical survival. 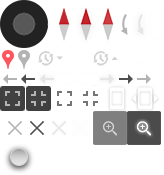 Allowing this to be done might suggest that the purpose of the image was about strengthening common bonds and group awareness to overcome dangers and difficulties. Some support for this exists at the cave itself. Archaeological discoveries in other caves in this region include small sculptures as shown in the British Museum’s 2013 exhibition Ice Age art: arrival of the modern mind. They were found in caves with large quantities of stone tools and animal bones that indicate people lived in the shelter of the daylight areas of these sites for repeated periods of time. Stadel Cave, where the Lion Man was found, is different. It faces north and does not get the sun. It is cold and the density of debris accumulated by human activities is much less than at other sites. This was not a good place to live. Lion Man was found in a dark inner chamber, carefully put away in the darkness with only a few perforated arctic fox teeth and a cache of reindeer antlers nearby. These characteristics suggest that Stadel Cave was only used occasionally as a place where people would come together around a fire to share a particular understanding of the world articulated through beliefs, symbolised in sculpture and acted out in rituals. *Please note that the Lion Man sculpture has been rotated with a high quality 3D printed replica as of 31 January 2018, in a planned rotation at the request of the lender. The exhibition Living with gods: peoples, places and worlds beyond is on until 8 April 2018. Supported by the Genesis Foundation. With grateful thanks to John Studzinski CBE. The accompanying BBC Radio 4 series will be broadcast from 23 October 2017. Living with the gods by Neil MacGregor will be published by Allen Lane in 2018. Find out more about some of the other key objects in the exhibition in this blog post.